As an official Ferrari licensed product, the S100i headphones are sold alongside Ferrari’s supercars in the Italian carmaker’s showrooms. Therefore they should be nothing but a bona fide luxury item in both appearance and quality. Hit past the break to see if they live up to the high expectations. When viewing the retail box of the Ferrari by Logic3 S100i headphones, there’s no denying that you have a luxury item on your hands. Inside the attractive-looking box, you will find the headset, a set of user-replaceable ear tips, a carrying case made of carbon fiber lookalike material, as well as a certificate of authenticity. As expected, there’s nothing missing in the retail box of the Ferrari by Logic3 S100i. The quality of the bundled accessories is unsurprisingly high too. Dressed in a white or bright red color scheme, the Ferrari by Logic3 S100i headphones are about as flashy as the cars which inspire them. As part of the Scuderia Ferrari collection, the headset takes clues from Ferrari’s heritage of racing cars. 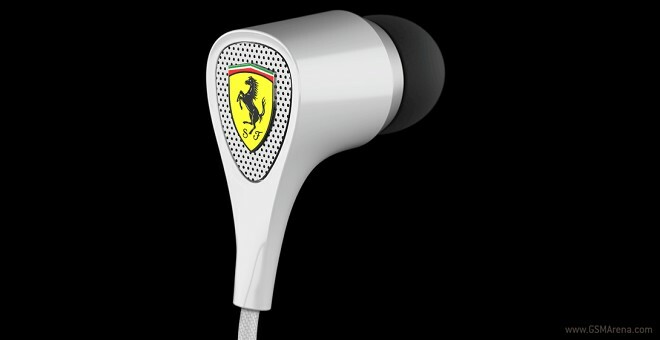 Specific design elements include a racecar inspired grille, as well as a massive Scuderia Ferrari logo on the side of the headphones. Furthermore, there’s plenty of Ferrari livery sprinkled throughout the headphones, thus leaving no doubt about the product’s brand. Build quality is up to snuff, though, as far as materials go, I’ve encountered similarly priced headphones which feel noticeably more solid. The S100i are made of glossy polycarbonate, which feels extremely sturdy. The audio jack is made from metal, so it is certain to last quite some time. The Ferrari by Logic3 S100i are very light, so prolonged use is not going to be an issue. The interchangeable ear tips are certain to offer comfort to any potential user. The three-button remote is well laid out and intuitive – in case you are not a iOS device user, there’s a version of the headphones available with a single button, which goes by the moniker S100. The relatively short cable is covered in fabric, so it is completely tangle-free. The only minor niggle I found with the headphones is their hard shell case – it is quite bulky and it doesn’t easily fit into a jeans pocket. The Ferrari by Logic3 S100i is equipped with a 10mm driver which features thin film acoustic technology for deeper bass and wider frequency range. The speaker’s sensitivity is 97dB. Impedance is at a standard 16 Ohms, while the frequency response ranges between 20 and 20,000Hz. The sound experience with the Ferrari by Logic3 S100i is memorable, but not for all the right reasons. The headset is extremely loud – the loudest in-ear model I have experienced to date. Bass however, dominates the entire sonic experience – it eats into the mid and high tones regardless of the style of music played and even at flat EQ settings. Given the price range of the headphones, I do believe that their users should be given a choice as far as sonic experience goes. On the other hand, if powerful lows are what one’s after, the Ferrari by Logic3 S100i will fit the bill admirably. The telephony audio quality of the headphones is good – nothing to complain about here. The maker of the Ferrari by Logic3 headphones aspires to create a product which successfully embodies the spirit of the iconic Italian cars – a task which has been successfully accomplished with the S100i. The headphones are loud, eye-grabbing, not perfect to live with on a daily basis, and far from cheap – everything a Ferrari supercar is. The Ferrari by Logic3 S100i is priced at $149.99. If you are a Ferrari fan with the budget to add another pair of headphones to your collection, I would highly recommend the S100i as a characterful headset despite the few quirks of its own. If however, you are looking for a no-compromise headset to use on a daily basis, I find the S100i to be a significantly more difficult sell.